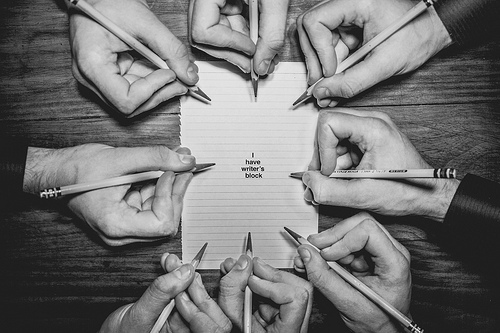 (All words and photographs by Kim). 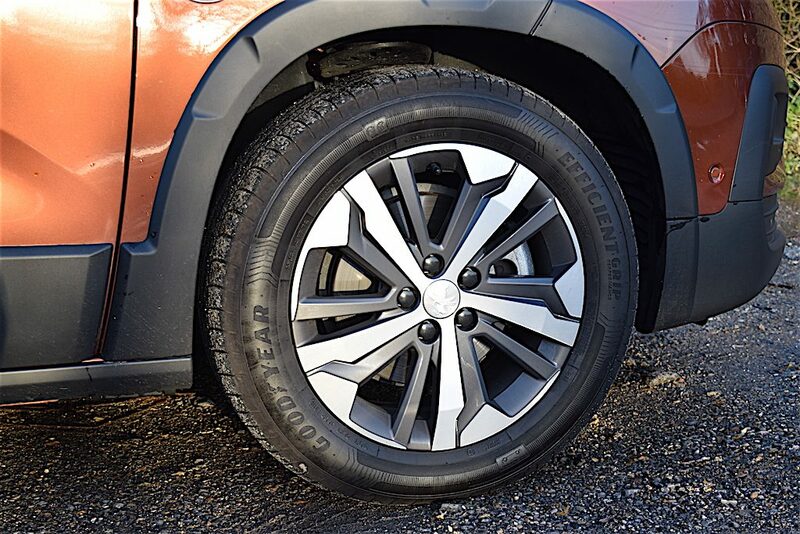 As we have been reporting on ‘Wheels-Alive’, currently there is a huge UK market for SUVs (‘Sport Utility Vehicles’), seen by many as ‘fashionable’, and it is true that some of these are seven seaters. However, it is equally true that in most of these SUVs, even the larger ones, the seating provided for the rearmost pair of occupants is something of a compromise, being relatively restricted in terms of access and available space, at least for accommodating adults. 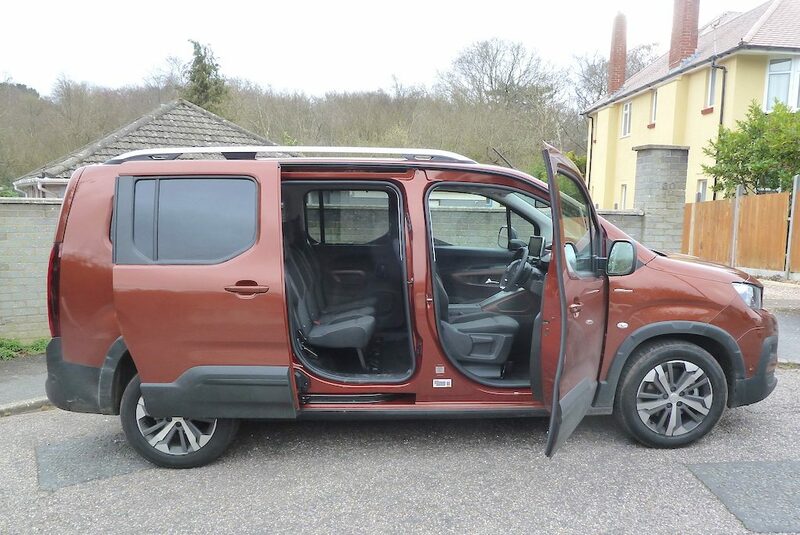 By contrast, in many cases a ‘traditional’ seven seater people carrier or MPV (‘Multi Purpose Vehicle’) offers greater practicality, improved comfort and more space for seven people. 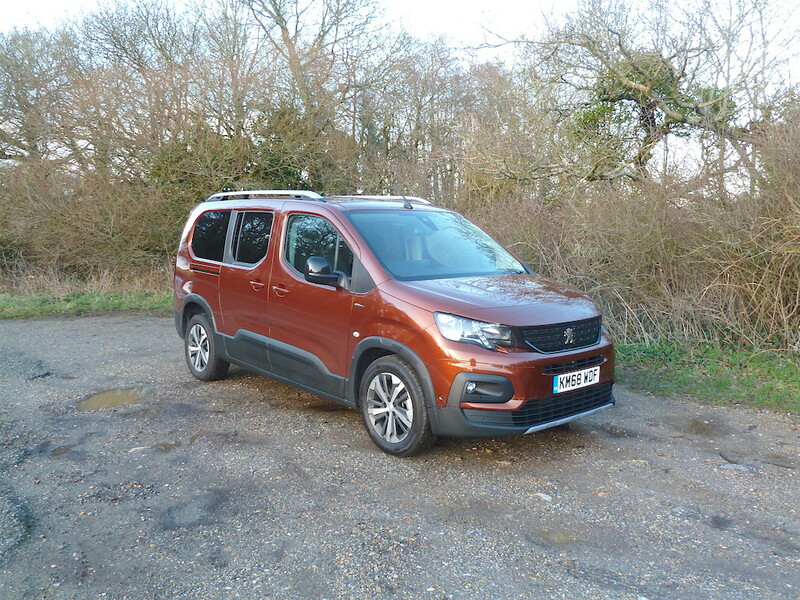 Enter Peugeot’s Rifter… The model was introduced in 2018 in ‘standard’ five seater form, and, from earlier this year, was also offered in ‘LONG’ seven seater guise – unsurprisingly with a longer wheelbase. In fact the Rifter is one of a trio of model lines within the PSA Group, all sharing the same basic body shell and all offering essentially similar mechanical specifications, but with distinctive differences in exterior styling and interior treatment, and with varying price structures. 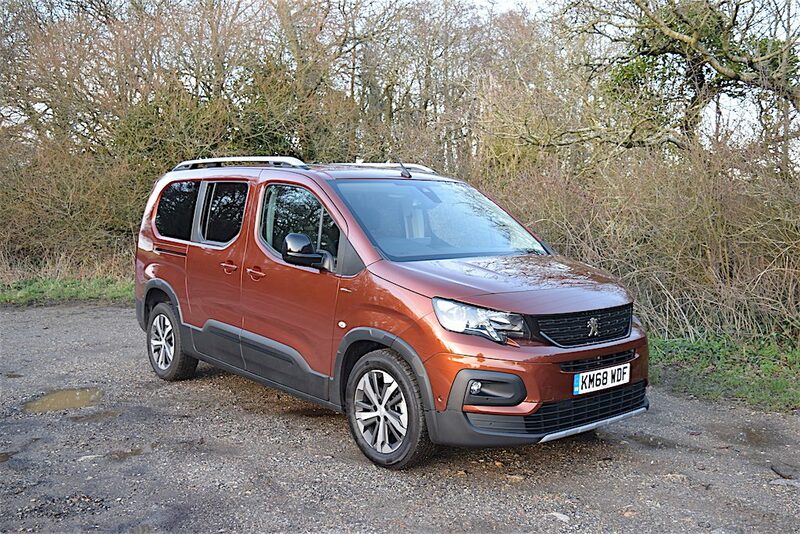 The other two are the Citroën Berlingo and the Vauxhall Combo Life (reports on various versions of these vehicles, plus First Impressions of the Rifter, when introduced last year, are already live on Wheels-Alive. 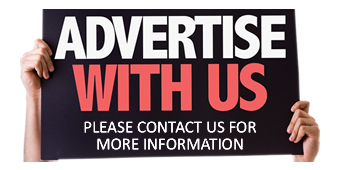 If you are interested in reading these articles, you can find them by using our ‘search’ facility). 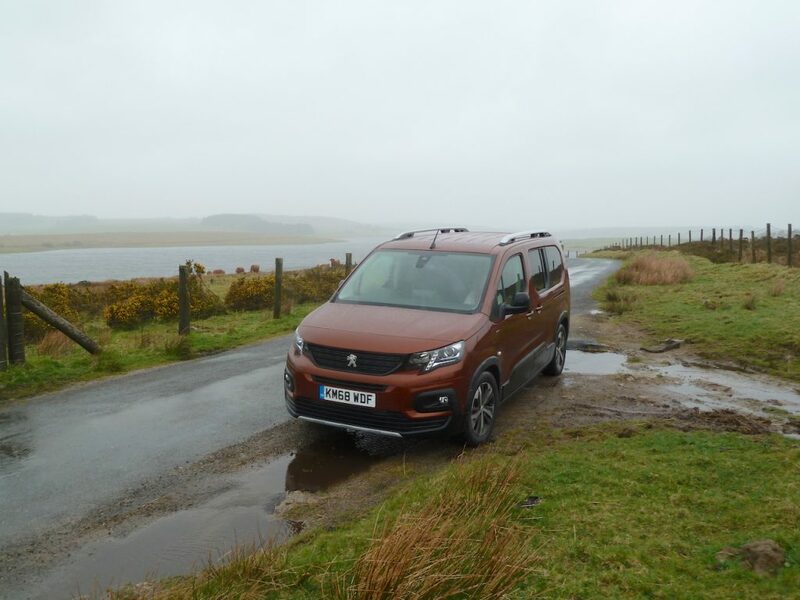 The subject of this road test feature is the seven seater, or ‘LONG’ Rifter, powered by Peugeot’s state of the art Euro 6 compliant four cylinder turbodiesel engine. At the rear is a large, high-lifting tailgate, providing unhindered access from bumper level to the load area. The tailgate on the top specification ‘GT Line’ model incorporates a separate opening rear window. The PSA Group’s EMP2 modular platform (also used for the 3008, 5008 and 308) is employed at the front of the vehicle, while at the rear, the Group’s RG5 rear end platform is found, as used for commercial models, and which deliberately (and sensibly) optimises load space without suspension unit intrusion. With the second row of seats folded and the two rearmost seats removed, there’s a massive, van-like load area with a capacity of 4,000 litres (more than 141 cu.ft) up to ceiling height. When required, the front passenger seat can be lowered to enable the carrying of very long loads (up to 3 metres or just under 10 feet). 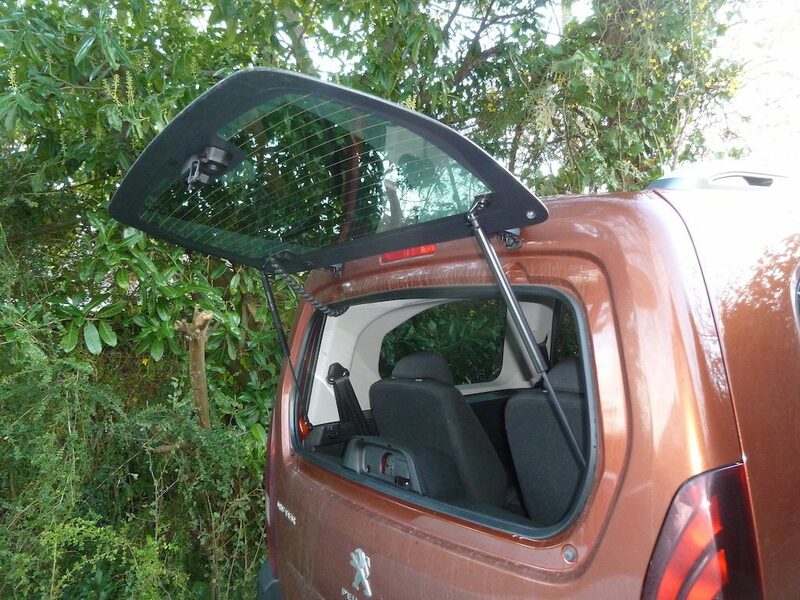 There are two alternative locations for the large rear parcel shelf, which, when not in use, can be stowed within the vehicle. The shelf has a carrying capacity of 25 kg (about 55 lb). The Rifter features numerous clever storage compartments, including an overhead locker above the windscreen, plus under-floor cubby holes just ahead of the second row of seats, and (on the Allure and GT-Line versions) a slide-out tray found beneath the driver’s seat. In addition there are generous size door bins, plus an upper glovebox compartment (with the front passenger airbag mounted overhead), and, on Allure and GT-Line variants) a very large, deep centre console storage area. Although, deliberately, there are SUV elements to the exterior styling, the bodywork is larger and more ‘boxy’ – some would say ‘van-like’ – in shape than most SUVs, and I’m not saying that in a derogatory manner, as the sensible profile endows the vehicle with far greater practicality than is often the case. 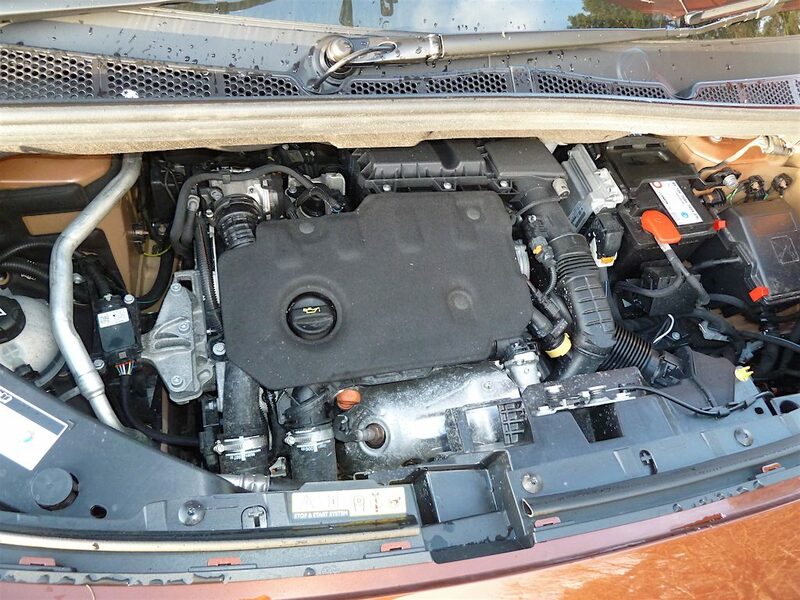 Engine options include the three cylinder 1.2 litre ‘PureTech’ three cylinder petrol motor, developing 109 bhp, or the 1.5 BlueHDi diesel unit, offered with a range of power outputs. For the ‘LONG’ variant, like our road test vehicle, these include ‘100’ (101 bhp), or ‘130’ (129 bhp) versions. For the standard five seater model, an additional ‘75’ (75 bhp) variant is available. Transmissions available, depending on the model, include five and six speed manual units, or PSA’s eight speed ‘Efficient’ automatic. There are three trim/specification levels, starting with ‘Active’ and rising through ‘Allure’ to ‘GT Line’. Without detailing every feature, suffice to say that even the ‘entry level’ Active versions are comprehensively equipped, including a wide array of safety and convenience systems, and manual air conditioning. As examples, standard gear includes Lane Keeping Assist, Active Safety Braking, heated/electrically-operated door mirrors, a multi-function computer, electrically-operated front windows, DAB radio, Bluetooth, front fog lamps with cornering function, roof bars, also automatic lights and screenwipers. Standard on all Rifters is a height-adjustable seat for the driver, plus Peugeot’s ‘i-Cockpit’ driving compartment, with a compact multi-function, flat-bottomed leather-trimmed steering wheel, and a high-mounted ‘head-up’ instrument panel, in the centre of which is a readout for the on-board computer, displaying useful aspects such as current and average miles per gallon figures, mileage range on fuel remaining, etc. A programmable cruise control/speed limiter system is also standard-fit. A ‘proper’ steel spare wheel, located in a cradle beneath the rear floor, is provided with all Rifters – most welcome, and well done Peugeot. Compared with the ‘entry-level’ ‘Active’ version, the ‘Allure’ trim level adds aspects such as rear parking sensors (very useful), air vents and a USB slot for travellers in the second row of seats, tray tables in the backs of the two front seats, a large centre console/storage unit, electrically-operated rear windows and aluminium alloy road wheels, and an electrically-activated parking brake control, among other items. Phone connectivity/voice recognition for the in-car entertainment system is comprehensive too. A centrally-positioned eight-inch touch screen is also provided in the ‘Allure’ versions, through which many functions are activated, including the DAB radio, and ‘Mirror Screen’ smartphone connectivity. The top-of-the-range ‘GT Line’ (like our test vehicle) additionally features such niceties as dual zone automatic climate control, ‘Open and Go’ keyless entry and exit and push-button start, an exterior temperature indicator (plus ice warning), power-operated folding mirrors, an opening window built into the tailgate, Connected 3D Navigation and Peugeot’s Connect SOS and assistance system, plus 17 inch aluminium alloy wheels and other enhancements. Optional on all versions is Peugeot’s ‘Advanced Grip Control’ system; it doesn’t offer all wheel drive but does optimise traction in situations where grip levels are low. The system is priced at £650, which includes 16 inch wheels shod with tyres offering improved grip, plus Hill Descent Control. Our Rifter ‘LONG’ seven seater test car was the range-topping ‘GT Line’ version, and in our case fitted with the 130 BlueHDi turbocharged diesel engine. This is one of Peugeot’s latest generation of power units, developed specifically with the aim of squeezing optimum levels of fuel consumption, emissions and performance from a relatively small capacity engine. With all the recent ‘bandwagon’ hype and vilification of diesel engines it is easy to overlook just how much genuine progress has been made lately by manufacturers in improving the environmental credentials of today’s diesels. It may therefore come as a surprise to some that, for example, all BlueHDi diesel-powered Peugeots are equipped with ‘Selective Catalytic Reduction’ (SCR) technology, in addition to a particulate filtration system. The three stage SCR set-up is designed to specifically target diesel combustion pollutants, taking out hydrocarbons and carbon monoxide. The result is a 90 per cent reduction in nitrous oxides, and the removal of 99.9 per cent of particulates. (This is in addition to the sometimes-overlooked inherent relatively low C02 emissions produced by a fuel-efficient state-of-the-art diesel motor). A plus point is that the filler point for the AdBlue is conveniently positioned adjacent to the diesel fuel filler cap. Diesel power is still relevant to many motorists (and at the Rifter’s launch in 2018, Peugeot predicted that 56 per cent of buyers would make this choice), especially for those who cover high mileages each year. An official ‘Combined’ figure of 47.1 miles per gallon is impressive for a large vehicle capable of carrying seven adults pus their luggage, with ease. The traditional diesel engine benefit of strong torque output (pulling power) from low engine speeds remains with the 130 BlueHDi unit, which offers 300 NM (221 lb.ft) from 1,750 rpm. This translates into an easy drive with minimal gearchanging required in urban situations and, for example, when driving in hilly areas. Electrically-assisted power steering is employed, not least to help make light work of low speed manoeuvres. The Rifter line-up starts at £20,460 for the entry-level five seater Active version; the top of the range five seater GT Line auto costs £26,210. However, the lowest price ‘LONG’ seven seater models come in at £22,160 (for the 1.2 litre PureTech ‘Active’), rising to £27,910 for the GT Line version with automatic transmission. The basic price of our test car was £26,510, but with extras fitted, including Metallic paint £545, Smartphone charging plate £100, Park assist & Vis pack 1 £700, Drive assist plus £200 and Family pack £100, the total cost rose to £28,155. All occupants of the Rifter during my time with the test vehicle were full of praise for the appearance and comfort of the interior, with its substantial and accommodating, pleasantly-trimmed seats and generous leg and head room for all, including the two passengers in the rearmost seats. The ride comfort was also commented on favourably, and from a driver’s point of view I liked the stability offered by the wide track, and the inherent impressive handling characteristics; very welcome. On the other hand, and inevitably, a vehicle with a large MPV body requires more space in which to park and manoeuvre, compared with a typical SUV. The Rifter is wide, and in seven seater form, long too, so driving in narrow lanes and tight situations in-town requires extra care. The same general comments apply to parking too; sometimes finding a space long enough and sufficiently wide to fully accommodate the vehicle can present a few difficulties. With the ‘Park assist and vis pack’ (as optionally fitted to our car), life is easier when parking the vehicle. 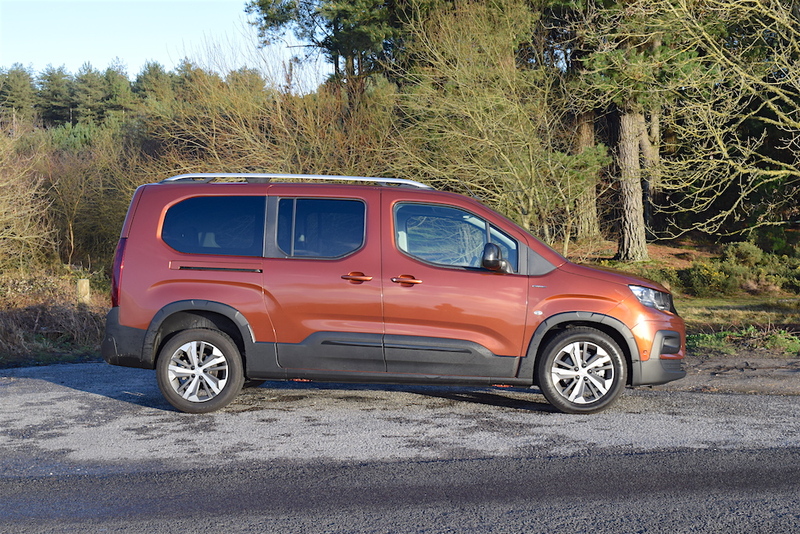 I found that driving the Rifter was enjoyable, with a comfortable driving position and a good view of the road from a fairly elevated position, and with the unmistakably clear instrumentation easily visible. Performance was impressive too. The 129 bhp engine pulled strongly and quietly at all speeds, even when fully loaded with seven people and their luggage – which was the case for about 400 miles (of the 700 or so covered during my time with the car), during a long weekend in Cornwall. The six speed manual gearbox fitted to our test car had an easy-action, smooth gearchange too. While not a sports car, of course, I found this Rifter to be an ‘enthusiastic’ performer, and there was plenty of power available for hill climbing and for overtaking. Acceleration, from rest and on the move, was impressive, even when the vehicle was fully loaded. Cruising on the open road was smooth and quiet too, and at 70 mph in sixth (top) gear, just 2,200 rpm was indicated on the tachometer. The engine pulled strongly and without fuss, and most happily from engine speeds above about 1,700 rpm, with the motor entering its ‘maximum torque’ zone. I found it best to change down to a lower ratio just before the tacho needle was dropping past this point. 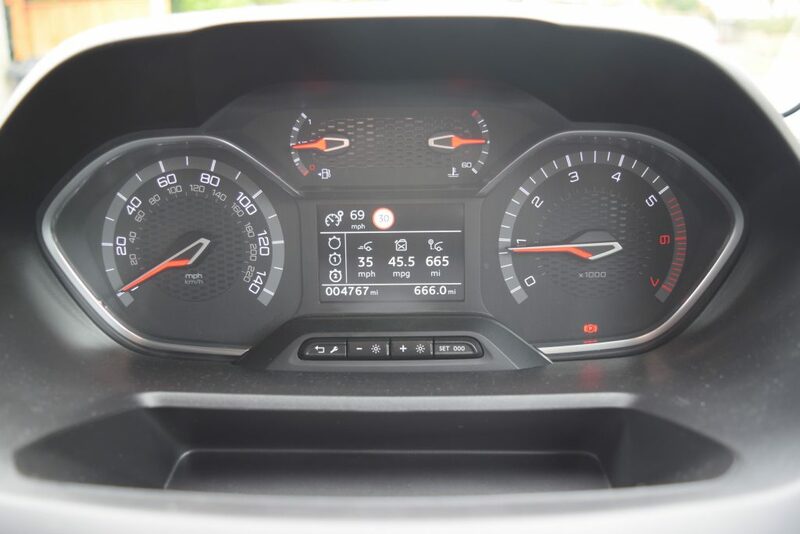 There’s also an indicator lamp on the dashboard that advises the driver when to change up or down a ratio – and the gearchange points seemed to coincide with how the engine ‘felt’ to me. In other words the lamp illuminated at about the same engine speed/load points as I would choose to change gear. I should mention that during my test of the vehicle, for about 400 miles we were driving in exceptionally strong head and side winds. The height of the bodywork did mean that the winds could be felt – but this was not surprising as, according to the BBC, wind speeds in the west country were between 50 and 60 mph for much of the time during our trip. In these conditions, I also felt that the electrically-assisted power steering was a little over-sensitive, it being difficult to smoothly make corrections to the buffeting side winds. However, when the weather calmed down the steering was much smoother in operation. It was very easy to manoeuvre the Rifter at slow speeds. The delightfully responsive compact steering wheel was easy to operate, and the power-assistance provided was spot-on. I was also impressed by the very good turning circle available in what is a fairly long and wide vehicle; again this was helpful in tight urban situations. The multitude of storage spaces throughout the vehicle proved oh-so-useful during our long trips with seven people aboard, including all those previously mentioned compartments, plus the elasticated pockets in the backs of the front seats. Personally I’m not a fan of electrically-operated parking brakes (in general; to me they never seem as positive as a manually-controlled handbrake), but the one on the test Rifter worked well, and held the vehicle with seven aboard on one of the steepest hills in the Bodmin area. The Peugeot also re-started without drama on the rain-covered slope. I have mentioned that for much of my time with the car I travelled with a full load of seven people (all adults) aboard, plus their luggage. We travelled about 400 miles in total in this way, and the generous passenger space and comfort was much appreciated by all. Getting into and out of the vehicle was helped by the sliding rear side doors, but it should be mentioned that for occupants of the rearmost two seats there is a very high step to negotiate. 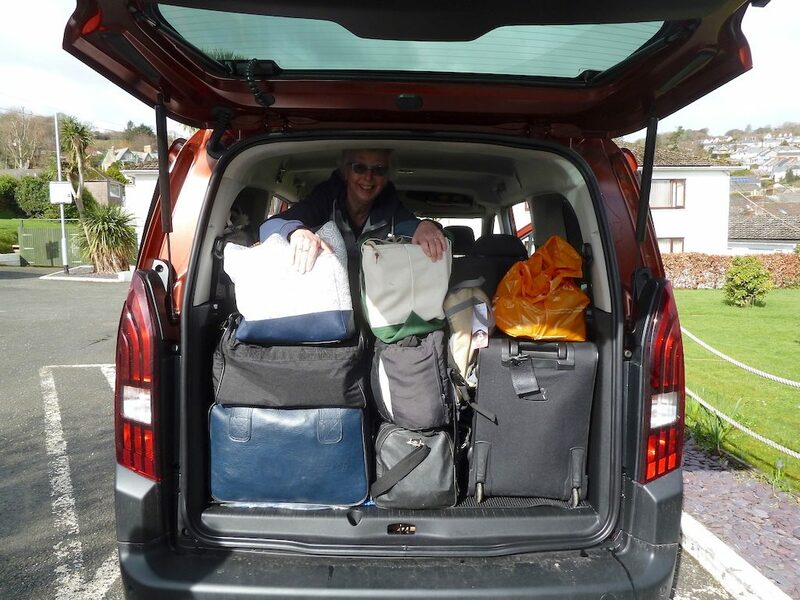 The Rifter – just about – took all our luggage for a long weekend away, but with seven seats in use, available space for baggage is ‘tight’. We found that the easiest way of loading the vehicle with ‘soft’ bags was to place/stack them behind the rearmost seats, with the tailgate closed. Our test car also featured an opening rear window, which could also be used for loading. With all the passengers and luggage aboard the vehicle proved to be very enjoyable for long-distance touring. Given the poor driving conditions (weather-wise) for much of our stay in Cornwall, and the very strong headwinds encountered for many miles, I was not expecting the Rifter to return fuel consumption figures close to the official ‘Combined’ figure of 47.1 mpg. I rate this Rifter as a very effective, comfortable, practical, fuel-efficient MPV. To my mind it provides greater versatility than a typical seven seater SUV, albeit and inevitably within a larger package. 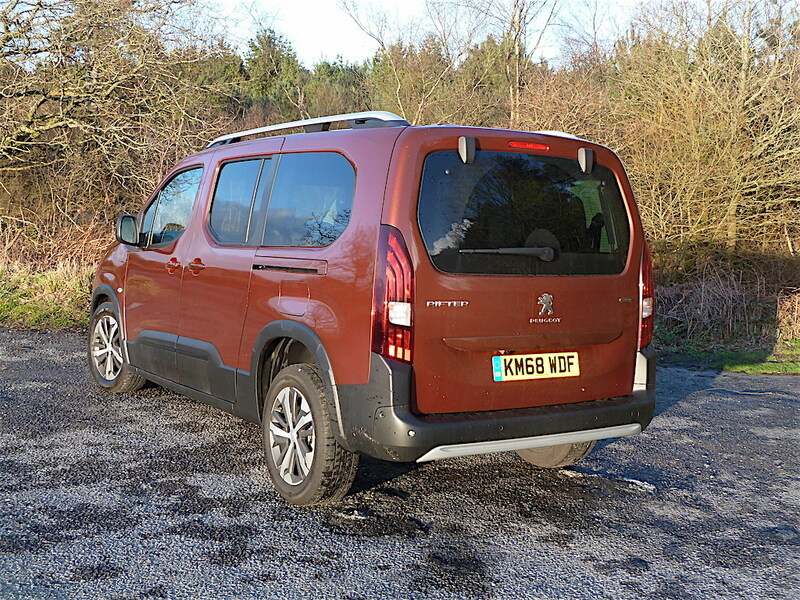 Peugeot Rifter GT Line LONG Blue HDi 130 S&S seven seater MPV. Engine: Euro 6.2-compliant, four cylinder, 1.5 litre (1499cc), direct fuel injection turbocharged diesel, with fuel-saving ‘stop/start’ system. Transmission: Six speed manual gearbox; front wheel drive. Power: 129 hp @ 3,750 rpm. Torque: 300 Nm (221 lb.ft) @ 1,750 rpm. Official WLTP figure: Combined, 47.1 mpg. Achieved during our Wheels-Alive test, over 665 miles, average 45.5 mpg. Estimated mileage range on a full tank (50 litres or 11 Imperial gallons), at our actual achieved mpg: Approximately 500 miles. 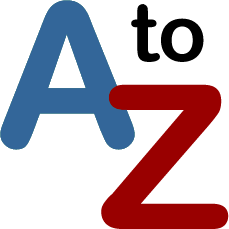 Taxation: First year, £205, standard annual rate thereafter, £140. Company Car Benefit in Kind: 2018/19: 28%. Dimensions: Length 4,753 mm (15.59 ft), Width 2,107 mm (6.62 ft), Height 1882 mm (6.18 ft), wheelbase 2,975 mm (9.76 ft), Kerb weight 1,540 kg (3,395 lb), braked towing weight, 1,250 kg (2,756 lb). Luggage capacity: 1,050 to 4,000 litres (37.08 to 141.26 cu.ft). (Note: Maximum luggage capacity quoted here, according to Peugeot… ‘Up to the ceiling with second row of seats plus passenger seat folded, with third row of seats removed’). Max. volume of storage areas in the passenger compartment: 96 litres (3.39 cu.ft). Basic Price (‘On the Road’): £26,510. (Plus, on our test car, Metallic paint £545, Smartphone charging plate £100, Park assist & Vis pack 1 £700, Drive assist plus £200, Family pack £100, making a total of £28,155).